High Places Realty is located in the heart of Leakey, a small, quiet town tucked away in the most picturesque part of the Texas Hill Country; the Frio River Valley. Leakey sits at the crossroads of US Highway 83 (serving as the "mainstreet" of town) and Ranch Road 337, one of the most scenic drives you'll experience anywhere. Leakey is your gateway to "high places", a rugged land of rimrock canyons, lofty hills clad in oaks and pinyon pines, deep green valleys, tumbling creeks and unlimited possibilities. The clear spring-fed Frio River meanders through our beautiful corner of the Hill Country, drawing vacationers, hikers, anglers, nature enthusiasts and artists year round. Many generations have come every summer to spend their vacations tubing the Frio River and kicking back at legendary Garner State Park. Fall and winter months bring the hunters with high expectations of bagging a trophy buck, turkey or Russian Boar. Many exotics have been introduced into the area and are now free roaming. Any time of the year is a great time to explore the Texas Hill Country, for a weekend or a lifetime. We count it a privilege to be able to help people like you own a part of it. NEW LISTING PROPERTY #013 - THE BEST OF BOTH WORLDS with this wooded, 2.6 acres just east of Leakey. As a landowner you will be steps away from the Frio River at the popular 2nd crossing with easy access to good swimming holes, fishing and tubing. If that were not enough you will also have access to a beautiful 8 acre park along the banks of Leakey Springs. Walk beneath towering Cypress trees along a mowed path and enjoy all the flora and fauna along the way. This is a nature lovers dream come true! 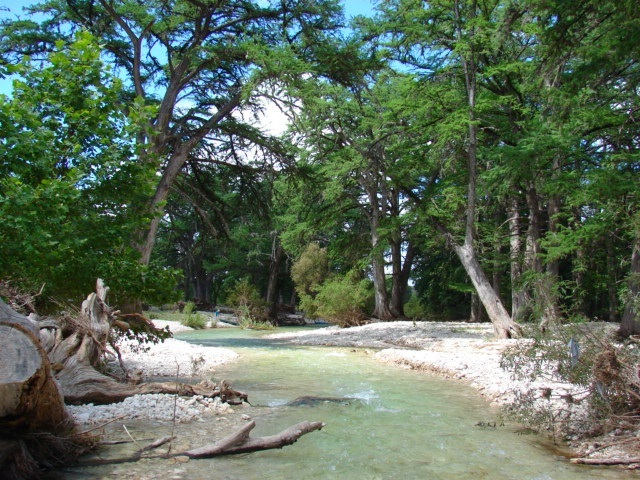 The Leakey Springs are an integral part of Leakey and are respected and kept protected by the landowners of Leakey Springs. Come and be a part of it! Click here for a Frio Canyon Map. Come by our office for your free Chamber Map and our Brochure of Listings.